Ever since I started this blog, I’ve wanted to talk about my experiences with cloth diapers, and explain how I use them. The key word here is “I” because all of my friends who use cloth (and that’s actually a good percentage of my friends that have babies) have their own ways of doing it. Not surprisingly, my cloth diaper style closely resembles my friend Kristina’s (my baby guru), because she’s the one who shared her cloth diaper experiences with me. So I’m going to write a series of cloth diapering tutorials so that anyone interested in cloth can get the basic information they need to get started. Because, honestly, if Kristina hadn’t shared this with me, I’d be spending gobs of money on disposables. Let me just start by saying that I thought cloth diapering was an old fashioned, messy, gross method and there was no way I was going to do it…until I learned that they’ve come a long way. A lot of cloth diaper sites will say, “Not Your Grandma’s Cloth Diapers,” and they’re absolutely right. Seriously— the diapers I use are hardly any more work than disposables. They aren’t any different to put on (okay, I guess you snap or Velcro them instead of using sticky tabs…but whatever), and they’re a piece of cake to clean. Actually, they’re probably easier to clean than a piece of cake…come to think of it. I almost exclusively use BumGenius 4.0 Pocket Diaper. What does that mean? I’ll break it down for you. BumGenius is the brand name. Apparently they are the number one best selling cloth diaper…because they’re easy to use. No surprise there. 3/16/16 update: BumGenius now has a BumGenius 5.0 Pocket Diaper available. This is an updated version of their 4.0 pockets. You can still get 4.0’s at a reduced price from some diapering stores that still have them in stock, such as Amazon’s BumGenius 4.0’s. One Size means that the cloth diapers grow with your baby. That’s wonderful because these darn babies grow so fast that clothing feels impossible to keep up with. At least the diapers offer stability. The diapers have snaps in the front that adjust to fit your baby’s waist and legs. You can have a chunkster baby, or a thin but tall baby…doesn’t matter. The diapers will work. BumGenius offers both snaps and Velcro (called Hook & Loop) for the waistline around the top. We have both styles, but I’d recommend the snaps. I’ve had the Velcro catch and beat up other diaper pieces in the wash…no fun. Also, I’ve heard from others that the Velcro wears out a lot faster than the snaps and they had to get the Velcro replaced with snaps anyway. 3/16/16 update: Yep, had to get the Velcro replaced with snaps when the Velcro wore out. Pocket Diapers are the style I use. The best way to explain these are with the picture below. There’s a pocket in the diaper, and you stuff it with an insert. The Insert…that piece of white rectangular material, goes into the pocket of the diaper. The inside of the pocket diaper is made of this amazing stay-dry material. The material wicks the moisture away from the baby’s bottom. Then, the moisture is caught by the microfiber insert, where it stays, since the outside material of the diaper is waterproof and keeps the mess from getting out. Now that isn’t to say these are perfect. I’ve had them leak on occasion, but from what I understand, that can happen with disposables too. What about the poop? Well, this is different depending on whether you’re breastfeeding/formula feeding, or if your baby is already eating solids. Note: this part really grossed my mom out, but keep an open mind and at least hear me out. For bottle-fed babies, all you need to do is pull the insert out of the pocket diaper and throw both pieces in the wash…poop and all. AHHHH, poop in the washing machine!!!! No!!! Gross!!! But…really? Yes. It’s similar to throwing a muddy sock in the wash. You wouldn’t think twice about that, would you? 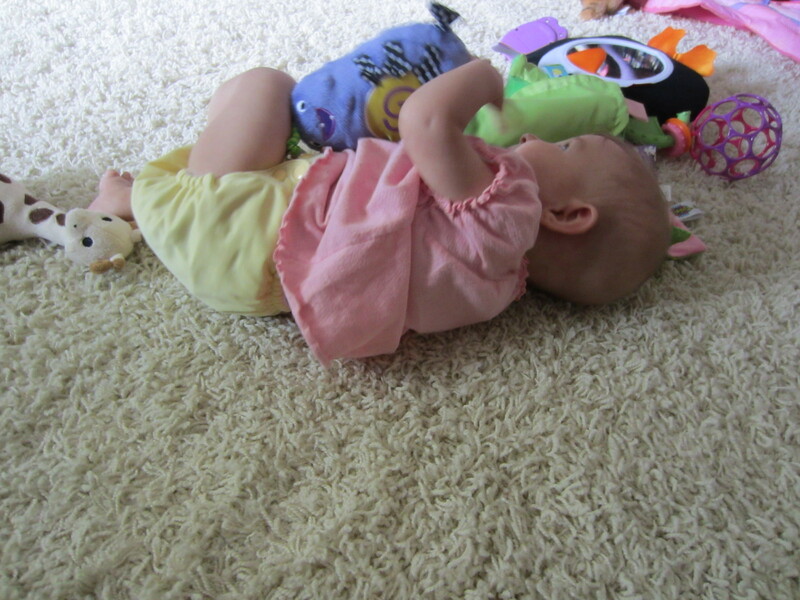 (Well, if you would…maybe cloth diapering isn’t for you). A baby’s bottle-fed poop is really soft and runny, so it’s easy to clean. There’s no toilet bowl dunking involved. Once you get over the weirdness, this is really simple. When your baby transfers to solid foods, you just dump the poop into the toilet. That’s a lot easier than I thought it would be. I have a sprayer to help, just in case, but I almost never use it. The poop balls fall right into the toilet bowl by simply turning the diaper over. I don’t know if that’s because the material is really good at making sure the poop doesn’t stick, or what, but it’s really not a problem. 3/16/16 update: As the kids eat more and more versatile foods, things can get goopy. I keep a spatula near my toilet, as well as the sprayer, because sometimes it’s easier to just scrape poop off real quick with a tool used exclusively for that purpose. 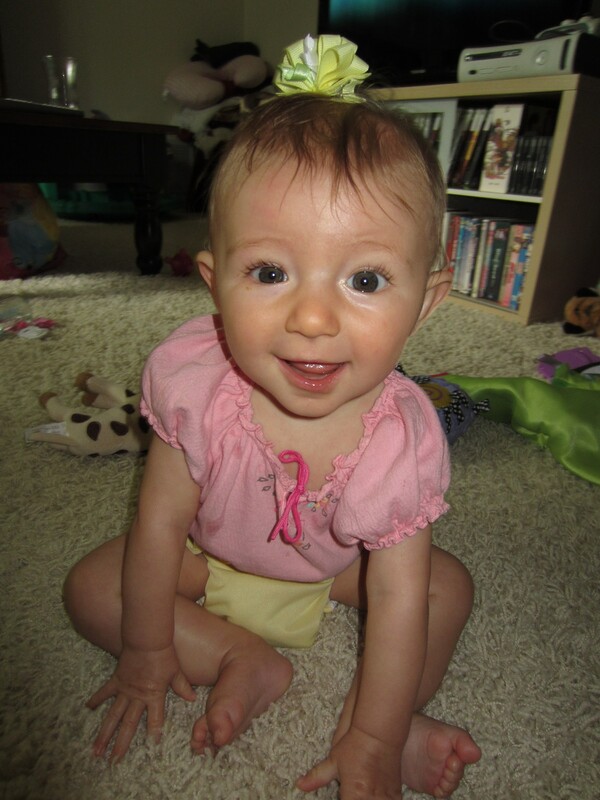 So there you have it: Cloth Diapers 101 | Diapering Basics. If you have any questions for me, please post them in the comment section below. I’m a strong believer in cloth diapers because it saves us so much money and I love putting cute, super soft diapers on my baby’s bottom. Plus, I swear her night time diaper is the reason she started sleeping through the night at such a young age (two months old, I believe). Getting a full night’s sleep saved my sanity (mostly). So if there’s any convincing argument to switch to cloth diapers, that’s it!